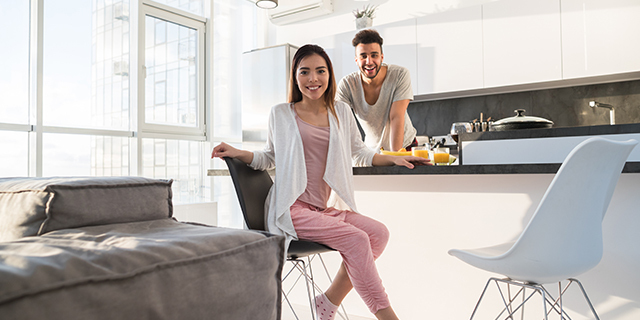 Many first time buyers in Canada’s biggest cities are settling for less square footage when entering the housing market, but a new study from Genworth Canada tracks just how many are opting for condos over detached homes and townhouses. According to the residential mortgage insurer’s 2017 First-Time Homeownership Study published this week, first-time homebuyers in the nation’s hottest markets are resorting to more affordable condominiums over detached homes and townhouses. In Vancouver, Canada’s least affordable city, 47 per cent of first-time buyers bought a condo, while 35 per cent did so in Toronto and 39 per cent in Montreal. The report is the second of its kind for Genworth to gain insight on Canadians’ financial preparedness. In the study, 1,803 Canadians between the ages of 25 to 40 who purchased a home within the last two years, were interviewed in January and February 2017. The results were analyzed by Environics Research Group. Genworth and Environics found that, between 2015 and 2017, the amount of first-time homebuyers in Canada dropped from 7.3 to 5.8 per cent, representing a 21 per cent decline in the volume of first-time buyers over that period. Environics Research Group Vice President David MacDonald says the decline in new first-time buyers is a result of the financial strain Canadians are feeling. “Effectively, what we’re seeing is a fifth of first-time buyers who would have been here in 2015 were no longer in the market in 2017 and that’s a direct result of the affordability challenges that are in certain markets, as well as the increase for regulatory requirements or financial sustainability requirements for first-time buyers,” says MacDonald. With escalating home prices in major markets, 64 per cent of first-time buyers said they are finding it difficult to purchase a home in Toronto, along with 63 per cent in Vancouver and 62 per cent in Calgary. Between 2015 and 2017, first-time homebuyers in Toronto paid the most for their dwellings, with a median price of $500,000. Followed by Vancouver with $410,000 and Calgary with $385,000. MacDonald says first-time buyers are feeling the pressure of rising home prices and are rethinking their options before choosing to invest. “We know in Toronto, in particular, that one of the motivations for buying their home is that they wanted to get in before prices rose further and we are seeing that balanced by people worrying that maybe now is not the best time to buy or that maybe it’s not as wise a financial decision as it might have been,” says MacDonald. With 54 per cent of first-time buyers making an income between $50,000 and $99,000, 61 per cent put a down payment of less than 20 per cent on their new home, between 2015 and 2017. To better handle the costs, MacDonald says many first-time buyers are seeking help in order to buy now. “Although home prices have gone up in those markets [Toronto and Vancouver] much faster than elsewhere they were able to get down payments by having more of their parents, the bank of mom and dad, chip in and help them get that first home,” says MacDonald. Conversely, in the last two years the majority of Calgary and Atlantic first-time homebuyers were able to afford a detached home. In Calgary, 48 per cent of first-time buyers bought a detached home, along with 66 per cent in the Atlantic. Even though Canadians are grappling with housing affordability and market uncertainty, MacDonald says first-time buyers are making wise decisions.